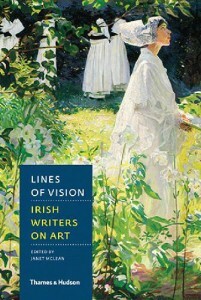 As part of the 150 year celebrations of the National Gallery of Ireland a collection of Irish writers were asked to write a short story or poem inspired by a painting from the collection. I was honoured to be one of these writers. After several visits to the National Gallery of Ireland I chose Return from Market painted in 1884 by John Lavery. Not only was I drawn to the setting of the river – I grew up on the River Thames – and the hues of a thousand shades of green, but I was also seduced by the lush water lilies. I was intrigued by the relationship between the old woman and the young woman travelling together in the boat. The image was brimming with suggestion. As in all my writing I found myself drawn to a story that explored their sensual lives and of how the potency of just one memory can re-tell the story of a whole lifetime. You can read this short prose piece, alongside a treasure trove of stories and poems by other celebrated Irish writers, in the Thames & Hudson anthology Lines of Vision, published in conjunction with the exhibition at the National Gallery. The exhibition runs until April 2015 and there is a programme of talks and workshops with many of the writers including myself .